Publishing piano music is one way songwriters can earn a living. Piano pieces are typically simple, intermediate or advanced. These songs can be written to address specific piano techniques or for piano students to play for fun. There are numerous piano sheet music publishers, but getting your music to them for publication requires following strict submission guidelines. If you've written piano music you feel would be suitable as supplementary music to a piano method, connecting with the publishers associated with piano music can lead to a successful career in piano publishing. Target your piano pieces to specific skill levels. Piano music publishers look for songs and exercises in simple, advanced and intermediate levels. Each of these levels have criteria regarding note range, chord presentation and technique applications. Before you attempt to submit your piano music to a publisher, ensure you piano music fits the skill levels you aim for. The best way to get a feel for the different levels is to compare your work to pieces already published. Purchase a current copy of the Songwriter's Market or check it out from the library. This is a market listing that includes an extensive section of piano music publishers, along with complete contact information and submission guidelines. The Songwriter's Market is the only resource with complete submission information for piano music publishers such as Alfred, Faber Music and Bastien. Select the most promising markets for your piano pieces and read the submission guidelines before submitting. The guidelines will tell you exactly what the publisher wants to see, how to format your submission, where to send it, what you will be paid and how long to wait for a response. Typically, a professional printed score will be one of the requirements, so a notation program such as Finale, Sibelius or the free MuseScore is something to have on hand. You can also make piano scores on line at no charge with Noteflight (see resources). Write a cover letter that briefly tells the publisher who you are. Give a synopsis of the piano piece you're submitting. 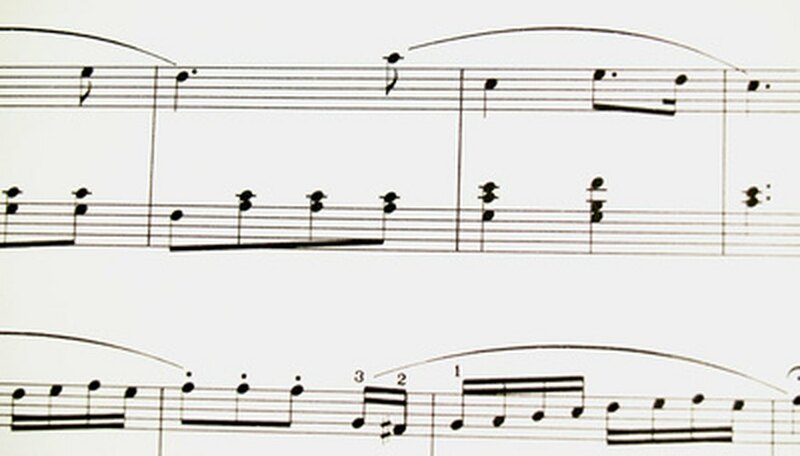 The synopsis should state the skill level of the piano music and detail the specific techniques the piece was written to address. Thank the publisher for considering your work. Print your piano sheet music on music staff paper. If you're using notation software, the sheets will print on music staff paper by default. Mail your piano score according to the guidelines stated in the submission guidelines. Wait the appropriate response time before following up on your submission.